Home Featured Politics Atiku Abubakar’s Speech At The Silverbird Man Of The Year Event, Lagos 3rd February 2019, As He VOWS TO END ASUU STRIKE PERMANENTLY WHEN ELECTED PRESIDENT. 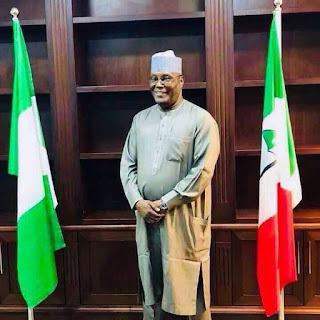 Atiku Abubakar’s Speech At The Silverbird Man Of The Year Event, Lagos 3rd February 2019, As He VOWS TO END ASUU STRIKE PERMANENTLY WHEN ELECTED PRESIDENT. Before I begin my speech, let me ask the audience to please rise and join me in observing a minute’s silence in honour of the memory of the 60 Nigerian citizens killed by Boko Haram in Rann, Borno State, this past Friday. (Pause 3 seconds to acknowledge the amen/amin from the audience. I also wish to thank God for sparing the life of Vice President Yemi Osinbajo, who survived a helicopter crash yesterday. May Almighty Allah grant him long life. I would like to congratulate Dr Ifeanyi Okowa for being crowned Silverbird Man of the Year and all the other winners here tonight. Well done. My sincere admiration goes out to each of and every one of you for your outstanding achievements which have been recognised at this magnificent venue and event. It is always a pleasure to be here as Lagos has always been kind to meand my businesses. It is therefore both right and fitting that we are in Lagos, our commercial and cultural capital, to celebrate the success of our fellow Nigerians. I have always believed that our nation has been blessed with an abundance of human talent and that our most valuable resources is not what lies beneath our feet but between our ears. That is why so many of our countrymen and women have been celebrated not just in Nigeria but around the world in the fields of business, sport, music, film, medicine and so many more. When I was preparing my speech, it got me thinking about the nature of success and how people become successful. And I thought I should address my comments not to those here this evening, who have already reached such stellar heights in their lives, but so many of the viewers at home who I know aspire to be successful themselves. The question of whether success is a function of nature or nurture has long been debated since humankind first came together. You can read thoughts from the ancient Greek philosophers on the subject. More recently, academic studies around the world have concluded that nurture is the biggest influence on how an individual progresses in their life, as we are all to a broad extent born equal into this world. Instinctively that is what I have always felt to be true. So, let me tell you about my own experiences and how they have guided me in my varied career in public service, business and politics. I was born to an impoverished family and when I was very young, I lost my father. So, despite a lack of funds it was my mother who raised me. I remain eternally grateful to her for ensuring I went to school every day, so I was able to receive an education which equipped me with the ability to start my career working in the customs service. How important it is to have a job, because however low you start if you work hard and are perseverant you can achieve whatever you put your mind to. As some of you may know, I am seeking to secure my ultimate job in two weeks’ time……. And I hope I have applied those three lessons in my job application. When I set up my microfinance bank in Adamawa State, I directed them to make 80% of the loans to women as they ensure the money is put to productive use. This bank has elevated over 45,000 families from poverty which I am very proud of. But what has made me proudest of all is the fact that 98% of the loans have been paid back, which enables my bank to help even more poor families. If I get the job, I will take this concept and roll it out nationally to elevate millions of families from poverty. As part of my desire to give back to the community which raised me, I have endowed nursery, primary and secondary schools, as well as the American University of Nigeria, in my hometown of Yola. I am aghast that as I speak our students across the nation are not being educated due to the ASUU strike that is about an argument over N60 billion. If I get the job I am seeking, my first task on day one – along with naming my cabinet – will be to end this disgraceful strike and get our students back to their studies. I will also triple the amount the Nigerian Government spends on education from 7% of its budget today, not just to the 15% recommended by UNESCO, but to20%. I recognise the value education can bring to the individual and the nation. But even more than that I want every child in Nigeria to have the opportunities I had. After I left the Customs Service I went into business and fortunately I appear to have been somewhat successful in it. And as I grew my businesses, I was able to employ more people and make more money. And as I made more money, I was able to employ more people and so on. So as of today, I have created over 50,000 directly jobs and a further 250,000 indirectly. I am also the biggest employer in my State. If I get the job, I will apply what I have learnt in my business life to create millions of jobs across our great nation. I trust it is not too immodest to observe that perhaps my skills and experience have never been more needed? Over the last four years the number of unemployed Nigerians has rocketed from 7 million to over 21 million, most of whom are our youths in their most productive period of their lives and many of whom have studied hard but cannot find a job. Did you know that based on the current rate of growth in unemployment that if something is not done 62% of our people will be unemployed by 2023? That is not just frightening, it is a time bomb. If I am selected for what undoubtedly be my toughest-ever appointment, I have clear plans on how I will create the best environment Nigerian has ever seen for creating jobs. To take just one example, I will establish a national apprenticeship scheme to give 1 million of ouryoung people vocational training with certification, which is so lacking in Nigeria today. I have fortunately reached a stage in my life where I do not need to work anymore, but I am grateful to Nigeria for giving me such a rewarding life on many levels. One of my favourite actors is Jack Lemmon who was a master of his art. I was always taken by his expression which he coined when he was at the height of his success, “to take the elevator back down” and which led him to set up acting schools for deprived kids in America, it is a phrase that sums up my attitude to life. Which brings me back to how did Jack Lemmon and every other successful person get to the top of the elevator in the first place? Some say it is ambition. Others say it is talent. For me I think it is a combination of both. For talent without ambition is a waste, yet ambition without talent is worthless. Yet there is one more ingredient that to me is crucial and which I want to impress on all those at home who believe they have the talent and ambition to succeed and that ingredient is pure, unadulterated hard work. They say that to be good at anything whether it is to play the violin or to become a great footballer takes a minimum of 10,000 hours of hard graft. That represents typically 3-5 years of commitment and practice. So, the last ingredient in my book of success is perseverance and determination. Who can forget the ‘Miracle of Dammam', when Nigeria became the first team to come back from four goals down to win a FIFA World Cup match – all the more extraordinary for the fact we only started scoring in the last 30 minutes of the game! Please put your hands up if you remember that match? Miracles happen in the Bible and the Qur’an and miracles can happen in Nigeria for individuals and our country. So, to everyone at home who wants to be on this stage in 2024 please remember that if you apply yourself and really, really want to achieve something then your future success is in your own hands. May I conclude by thanking Ben Murray Bruce for hosting such a wonderful evening and for giving me the opportunity to share my thoughts with you all. I would like to congratulate the winners once more and wish all those who want to better their own lives the will to do so. For one thing is for sure, the more successful people we have the more successful Nigeria will be. And as for me and my chances? If there is a better candidate for the post than me,then so be it. I can only hope the recruitment process is fair. However, I can say for the record I have done much more than 10,000 hours of practice to do the job well and promise that if I get the job I will apply every ounce of my determination and perseverance to repay the confidence in hiring me and to make a great success for my employer, the Nigerian people. May God bless you and God bless Nigeria.